Mercedes-Benz introduces intelligent RFID based manufacturing operations throughout the supply chain for flexible Sprinter production. Mercedes-Benz Vans has been a major innovator in the area of intelligent production amongst light commercial vehicle manufacturers for years and now the business division is preparing for its next stage. For production of the new model of the Sprinter van, Mercedes-Benz Vans is bringing new connected series-production technologies online. The reasons behind this are increasing requirements on flexibility and efficiency. For example, the variety of variants will increase further as the result of manufacturing electrified vans. In addition, the global production network of Mercedes-Benz Vans has been utilised near capacity for years, and sales are rising continuously. The employees benefit from the increasing digitisation in production by being relieved of routine tasks. This is to give them more and more time for higher-end tasks. Between 2017 and 2025, Mercedes-Benz Vans will invest more than 200 million euros in the expansion of intelligent production. At a press event at the Sprinter plant in Ludwigsfelde near Berling, Frank Klein, Head of Operations of Mercedes-Benz Vans, gave journalists insight into the latest technology operations. “We will take the next logical step in the advancement of intelligent production at Mercedes-Benz Vans with the forthcoming new Sprinter“, says Frank Klein. “We have already accomplished a great deal in recent years. With the paperless factory, self-driving transport systems and a host of other projects, we have set the course for the future. As part of our ‘IntelligentProduction@VANS‘ strategy, we are now setting another milestone on the road to the fully connected ‘factory of the future‘ for more efficiency and flexibility. We want to realise potentials throughout the entire production process with new technologies such as RFID. Our production operations around the world are to be fully digitised by 2025“. For employees in logistics and production, it has been a long-pursued goal to knowing exactly where a particular component is at any given time. The benefits are obvious: This information allows them to respond flexibly to changes in the sequence, such as caused by delays in certain areas, and change plans on short notice. In addition, they always know the current warehouse stock. The quality assurance employees are consequently also always informed whether the right component was installed in the right vehicle. All that is already a reality in the Mercedes-Benz Ludwigsfelde plant. In a pilot phase, RFID (radio-frequency identification) technology is used to track and identify the door mirrors and seats automatically and contactlessly via radio waves. This happens from the moment they are received to the time the Sprinter rolls off the lines. The project is being implemented in close cooperation with the Fraunhofer Institute for Factory Operation and Automation (IFF). The goal in Ludwigsfelde is to digitally connect up to 40 parts with the production system via RFID in the next few years. With the ramp-up of the new Sprinter, the technology will become an integral part of series production in Ludwigsfelde. Other locations of Mercedes-Benz Vans are also to be equipped with this technology. The implementation already starts far outside the gates of the Mercedes-Benz plant at the suppliers. They attach the RFID tags to the components. As a result, the suppliers are the first to benefit from the advantages of the technology in their own logistics and production operations and are able to identify and track parts via radio waves. The labels are computer chips roughly the size of a postage stamp, which can store and send information. To track the components with these transponders, readers are located at key points of the logistics and production operations. The wireless contact is established by radio waves generated by the readers. The waves power the chips and thereby prompt them to send their information. 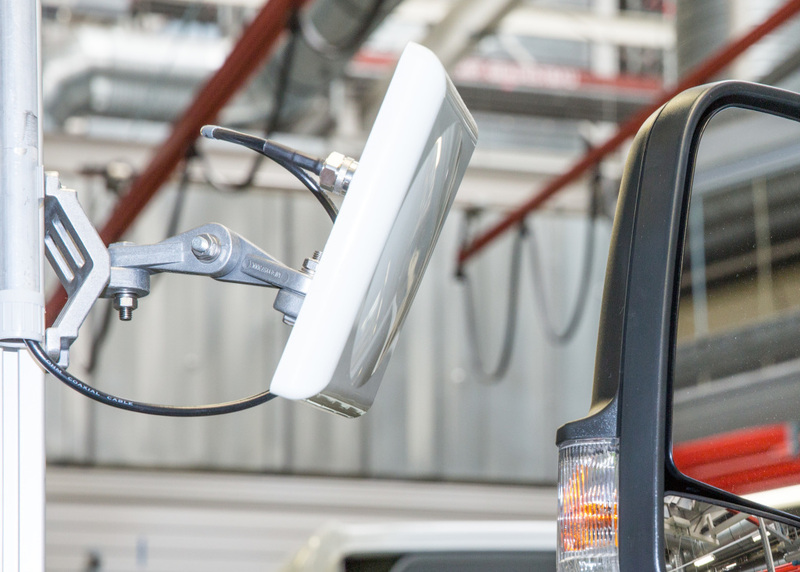 RFID also offers advantages in after-sales, when the vehicle later is in customer hands. It allows service employees to use information stored in databases to retrace which parts are installed with the greatest of ease. Since 2012, automated guided vehicles (AGV) have been deployed effectively in the assembly operations in Ludwigsfelde. These are controlled for one by being connected to the IT system, but for another also by RFID. To this end, the transponders are in the floor of the factory buildings and contain driving commands. Ten more AGVs will be used and additional routes will be developed with the start of production of the new Sprinter. For about a year now, the second generation of the AGVs has already been operating in the plant. These vehicles communicate with each other via Bluetooth to coordinate their actions autonomously. This ensures a smooth traffic flow even when several AGVs cross paths. Up to now, simultaneous coordination was only possible between a few vehicles. By the end of the year, the first vehicles are to be able to operate freely and thus flexibly in the buildings thanks to optical sensors. Currently, the AGVs still follow predetermined paths. The AGVs of the first generation also are able to recognise obstacles such as forklifts or pedestrians via laser scanning. In this case, they stop automatically. Currently, some 100 technology and IT experts of Mercedes-Benz Vans at headquarters in Stuttgart and plants in Germany, Spain, Argentina and the USA are working on more than 20 projects in intelligent production. The global teams cooperate closely in flat hierarchies across national and specialist unit boundaries. Employees from Logistics, Quality Assurance, Engineering and IT are already part of the project teams at the start of the planning phases. The relevant experts also involve production employees early to ensure the practicality of projects from the start. Intelligent production is a component of employee qualification and the apprenticeship programme as well. “We are also opening up more and more to the outside world to be even closer to the heartbeat of new technology“, says Klein.